Here’s an idea: mandate 10 or 15 mpg (really high for a racing engine; they’re usually around 4-5), and some other equivalent if hydrogen is used, and then have no engine rules beyond that. That’ll produce green engines… you’ll see lots of diversity (hybrids, hydrogen, etc, etc). Now that is what I'm talking about. I am guilty of occasionally writing a post attacking Max's supposedly green measures for F1 and that might give the impression that I am an old dinosaur unaware of the damage we do to the planet. That is not so, in fact - I am well aware that we need to be researching alternative forms of energy, if for no other reason than fossil fuels will run out sooner or later. What does annoy me is the "CO2 emissions cause global warming" nonsense, since it has been proved repeatedly that worldwide CO2 levels increase after global warming, not before it. The whole carbon offset industry is based on a false premise, therefore, and I fail to see why F1 should go along with it. But alternative fuels must be developed and Malcolm's comment shows the way for F1 to be a major force in our research into what is possible. He has also pointed out that this gives us an opportunity to free the engineers from the stultifying restraints put on them in recent years, thereby allowing their creativity and invention to flourish once again. What is happening in F1 now is strangely similar to the events of the sixties. In 1961, the engines were restricted to 1.5 liters unsupercharged in an effort to limit the speeds the cars were attaining (does that sound familiar?). As it happened, the attempt was unsuccessful and speeds continued to rise, mainly thanks to the rear-engined and monocoque chassis revolutions that were happening at the same time. Aware that the small engines had failed in their quest and had the disadvantage of being less dramatic than larger ones, the governing body changed the rules in 1966 to allow for 3 liter engines (or supercharged 1.5 liters). 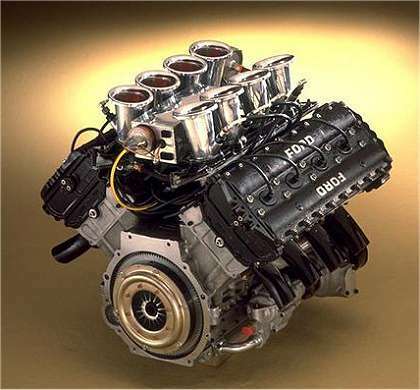 A mad scramble for suitable engines resulted and some very odd and very ineffective solutions were tried before the Cosworth DFV made its debut. It is a fascinating period for the F1 enthusiast, a time of experiment and innovation, a time when, if you hit on the right answer, you shot to the front, if you tried something less effective, you could find yourself at the tail end of the field. Cooper went with a big and heavy Maserati V12 and never returned to their glory days as a result; Lotus introduced the Cosworth V8 and went from triumph to triumph from there onwards. And BRM produced the H16, a fiendishly complex monster that produced plenty of power but invariably went bang in short order; this too heralded their ultimate demise. Funnily enough, it was the Repco-Brabham V8 that dominated to begin with. This was based on an existing Australian engine which, although not enormously powerful, had the virtue of being reliable, thereby allowing the Brabham cars to win two quick championships while the others were still finding out how to make their solutions last a race. It was a period of great diversity and ingenuity, demonstrating how interesting things can get when restraints are lifted. And what better cause to lift restraints than in the service of the green revolution? There are workable alternative fuel sources available already, but the manufacturers are slow in developing and refining them; the most advanced to date is the hybrid car, which is more of a cosmetic thing than a real advance, since it uses the same amount of gas as any other car. Formula 1 could be the leader in turning the possiblities into realities. The will to win is such that, given Malcolm's formula, the engineers would find ways to make things work. In a very short time it would become clear which was the most efficient and workable solution and the manufacturers could concentrate their energies on developing that, rather than a horde of other suggestions. It is a radical idea but, if we really believe that F1 must move with the times and justify its existence, this is the way to go. Max's plan to have a few energy-reclaiming devices glued on to the same old gas guzzlers of the past is just not cutting the mustard at all. The EU may well have put an end to Max's engine freeze by their pronouncement - but will he have the courage to make the really radical changes that are necessary? Can we start a petition? I would say that a good majority of F1 fans visit a handful of websites. If there was an online petition it would be interesting to see how far it would make it up the corporate latter. But that's the real problem - FAR too simple for the FIA to implement something like that. But it would be a nice return to those days or engineering brilliance my Dad told me about. Dan M - I second that!! I know a number of bloggers frequent each others blogs (I've seen them on the comments) so it should be pretty easy to get word around if something like this was setup. Sidey: Hey, all I do is post the articles (plus a little bit of editing) - the stories come from a news agency. So I can see why it looks as though I'm referring to myself but it doesn't feel like that! Dan: Perhaps it would be a good idea to start a petition (who would we send it to?) but, unfortunately, I'm not a petition-starting person. I wouldn't have the faintest idea how to go about it. Darkblue: I agree, it's the simplicity of Malcolm's idea that is really appealing. Surely everyone is fed up with the complexity of FIA regulations by now and ready for some sweeping changes to be made. I think it's a great idea. Of course the only fly in the ointment is that a large number of Petrol companies currently sponsor either teams or GP's and I can't see them being too happy about that. Possibly why is has not come to fruitition yet. I think the oil companies have seen the writing on the wall and are looking quite seriously at alternatives now, Peril. Many of them are already offering bio-fuels on general sale (although these are just as bad for the environment - at least the companies are trying). There are some very interesting ideas in the pipeline too. The oil companies shouldn't be a problem as they are all experimenting with bio-fuels, hydrogen etc. Besides losing the oil companies would not be a huge problem. We have lost the tobacco money (apart from Ferrari) and that has had no effect whatever despite all the predictions of doom. If the oil companies left F1 it would open things up to smaller more enterprisng companies. The kind of people who built the sport before the coroporate types moved in. The biggest problem is implementing something like this now that the FIA is intent on capping budgets. Of course the reason for budget caps is to stop research in areas that are not road relevant so I suppose Max could be persuaded away from them for something like this. You don't think this has been his plan all along? Taking a hint from one of your spoof articles in the recent past, i wonder how environment friendly F1 would be considered if the FIA mandates that liquid hydrogen be used as the fuel in IC engines. Liquid hydrogen does bring echoes of the cool fuel controversy, Uppili - but that might be the problem right there. Keeping it cool enough to stay liquid will be fairly difficult. Hydrogen as a gas is the ultimate answer, however, and quite practical now. But good old Max will stand in the way, won't he...? There should be no problem in keeping the hydrogen as a liquid. Either Boyle's law or Charles's law deals with this. Wish I could remember that far back. Anyway the point is temperature, pressure and volume are all inter-dependent so if you have a high enough pressure you don't need a low temperature. If you sit on top of Mount Everest and boil water it boils at 40 something Celsius because of the low pressure. I imagine that cooling hydrogen until it liquified at atmospheric pressure would be impossible as it boils at -252.87 Celsius which is only 20 degrees above absolute zero. So all you need is to create pressure. A pressurised fuel tan should be possible. One point worht considering on all the talk about rising sea levels. Every gallon of petrol you burn produces a gallon of water. Pretty much the same applies to all fossil fuels. So we have added a lot of water to the seas. "One point worht considering on all the talk about rising sea levels. Every gallon of petrol you burn produces a gallon of water. Pretty much the same applies to all fossil fuels. So we have added a lot of water to the seas. " What? No way can that be correct. These are all very interesting ideas. The technology already exists for much of what we are talking about. The pressurized fuel cell for liquid hydrogen is already here. These is also a fuel cell that seperates the hydrogen from oxygen in water with the use of an aluminum compound -Clive you turned me on to this technology. It was developed at Purdue University I think. So what I am trying to say is that everything is here. The FIA needs to pull it all together and sort it out and that is what will never happen--one because Max is too bullheaded and two because it is too much work for them. You're right, John - Max is probably not the right guy to have if we want to see really radical solutions in F1. But the sport could so easily be a leader in the introduction of new technologies to suit the future. It has done so many times before, after all. "Sidey: Hey, all I do is post the articles (plus a little bit of editing) - the stories come from a news agency. So I can see why it looks as though I'm referring to myself but it doesn't feel like that!" i that case, apologies. hadn't realised.